Location: Bass Strait, off Launceston, Tas., & Spencer Gulf, off Adelaide, SA. Chappell Island is not only an island of snakes, it is an island of giant snakes, 3,000 giant highly venomous tigersnakes on one tiny island. Chappell Island tigersnakes are the largest tigersnakes in the world yet they survive on an annual six week feast of mutton bird chicks before enduring over ten months of enforced fasting once the fast-growing mutton bird chicks are too large for the snakes to eat them. There is nothing else for the adult snakes to eat. 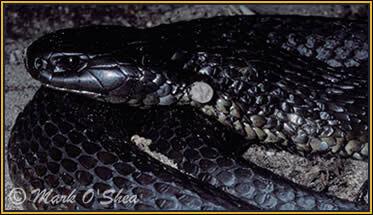 The island tigersnake population is also unusual in that it is very adult-heavy, there are very few juvenile tigersnakes to be found. Mark and American herpetologist Dr Terry Schwaner set out to investigate why there are so few juveniles and capture some of the adult tigersnakes that Terry recorded and marked over the last 17 years to see how much they have grown since he last met them. Could the Chappell island tigersnakes be the oldest living snakes in the world? This old Chappell Island tigersnake (Notechis ater serventyi) has a large parasitic tick on its neck.